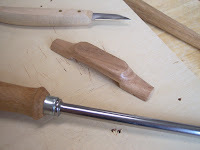 After final shaping, I used a burnisher on the edges of the handle to shine it up a bit. The original handle is shiny and smooth from years of oily hands opening the cupboard. I tested a few finishes on scrap pieces—Boiled Linseed Oil, Tung Oil, and Watco Wipe-On Poly—and found that BLO darkened the wood the right amount. A couple coats of that, a week or so to cure, and then a topcoat of dark paste wax ought to age the cupboard enough that it will look a little more like the original. 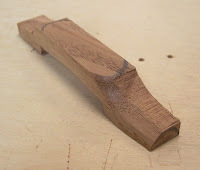 This was the part of my current project that I was most looking forward to making: wooden hinges. I roughed out the pieces on the bandsaw and achieved the final shape with a Murphy carving knife and spokeshave. The facets created by the carving knife added to the handmade look that I was trying to replicate in the original cupboard. 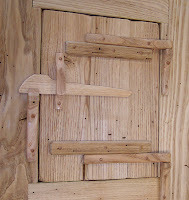 I don't know what tools the maker of the cupboard used, but the surfaces of the hinges and handle unit appeared (in the book) to be carved rather than planed, chiseled, or filed. 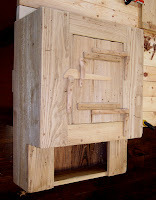 The last photo shows the hinge attached to the door. The d esign enables you to remove the door by lifting it up off the hinge pins. 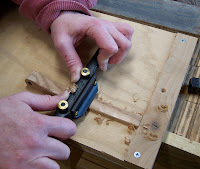 Making these hinges was so much fun, I'll be on the lookout for other pieces that employed them.